This grille is for the MK2 model and will not fit the MK2.5 facelift version, 2001 to 2005. MX5 MK2 / MK2.5. MX5 MK3 / MK3.5. MX5 New & Used Parts. Being stainless steel (and not aluminum), provides very effective resistance to even larger stone hits, protects the radiators and intercooler. Kühlergrill mit Wabenmuster Mazda MX-5 TYP FL 2001 - 2005. Ein schöner Kühlergrill der den Kühlerlufteinlass hervorhebt. Der aus Edelstahl gefertigte Grill schützt gleichzeitig den Kühler vor Steineinschlägen. 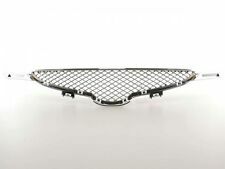 This grille is for the Mk1 & Eunos models (1988-1998). You can now protect the Radiator and Engine without impeding airflow. Your Radiator and Engine are at risk. from flying stones and debris. A Zunsport grille set at the bottom of the RX8 front bumper brings the lower area into view and with it a visual depth to the front portrait resulting in a full definition of the original design. This is a genuine Zunsport kit so you are buying quality. MX5 MK2 / MK2.5. MX5 MK3 / MK3.5. MX5 New & Used Parts. Being stainless steel (and not aluminum), provides very effective resistance to even larger stone hits, protects the radiators and intercooler. Good decorative effect, preventing sight over engine internals in both versions. Edelstahl Grill Leisten für Mazda 3 ab Bj. Die Grill-Leisten werden mit einem bereits vorinstalliertem 3M Klebestreifen am Fahrzeug montiert. - Exakte Anpassung an alle Kanten/ Ecken und Wölbungen. - Komplett aus V2A Edelstahl und absolut rostfrei! The RX8 is hiding its light under a bushel until you add a Zunsport grille. If you have the courage to move the number plate to the bonnet you then have a distinguished and confident stance. This is a genuine Zunsport kit so you are buying quality. Zunsport grilles are easy to fit and once in place will blend with the original design precisely. We also have products manufactured for ourselves and these are made to the highest standards. Kühlergrill mit Wabenmuster Mazda MX-5 89-98. Ein schöner Kühlergrill der den Kühlerlufteinlass hervorhebt. Der aus Edelstahl gefertigte Grill schützt gleichzeitig den Kühler vor Steineinschlägen. Durch das Wabenmuster erhalten wir ein erhöhten Luftdurchlass und ausreichende Kühlung. MX-5 Kühlergrill mit Wabenmuster Mazda MX-5 Typ NB 1998 - 2000. Ein schöner Kühlergrill, der den Kühlerlufteinlass hervorhebt. Der aus Edelstahl gefertigte Grill schützt außerdem den Kühler vor Steineinschlägen. Fits all Mk2 MX5 models, 1998>2000. The mouth on an an MX-5 is the perfect trap for flying debris, so fitting one of these top quality black stainless steel hi-flow grilles is essential protection for your radiator. Fits all Mk1 MX5 models, 1989>1998. Mk1 1989>1998. The mouth on an an MX-5 is the perfect trap for flying debris, so fitting one of these top quality black stainless steel hi-flow grilles is essential protection for your radiator. Edelstahl Grill Leisten für Mazda CX-5 Bj. Die Grill-Leisten werden mit einem bereits vorinstalliertem 3M Klebestreifen am Fahrzeug montiert. - Exakte Anpassung an alle Kanten/ Ecken und Wölbungen. - Komplett aus V2A Edelstahl und absolut rostfrei! Add to Favourites. We also have products manufactured for ourselves and these are made to the highest standards. A Zunsport grille set added to the rear of the RX8 defines the lower section of the bumper around the central mounted lamp and accentuates the detail for those that will inevitably have the longest view of your car. The towing eyes are hidden behind the grille, but in the event that they are needed the grille can be removed easily, without special tools, to gain access for towing ropes etc. This is a genuine Zunsport kit so you are buying quality. Edelstahl Grill Leisten für Mazda 6 Bj. Die Grill-Leisten werden mit einem bereits vorinstalliertem 3M Klebestreifen am Fahrzeug montiert. - Exakte Anpassung an alle Kanten/ Ecken und Wölbungen. - Komplett aus V2A Edelstahl und absolut rostfrei! With these Zunsport grilles you can be assured of a flawless fit and finish. Supplied with easy to follow instructions. Fits all Mk4 models, 2015>, Including the new RF. We source our products from all over the world to bring you the best in MX-5 parts and accessories. Kühlergrill mit Wabenmuster Mazda MX-5 TYP FL 2001 - 2005. Ein schöner Kühlergrill der den Kühlerlufteinlass hervorhebt. Der aus Stahl gefertigte Grill schützt gleichzeitig den Kühler vor Steineinschlägen. Stainless Steel Grill Trims, MX5 Mk4 & RF. Fits all Mk4 models, 2015> Including the new 2016> RF. They are easy to install using the pre-applied 3M tape, and removal of the original grille is not required. 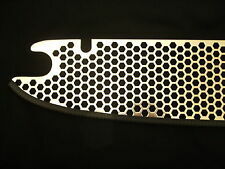 This MX5 / Miata Grille is to fit the Mk2 model (1998 to 2000). The Lockwood MX5 Grille not only protects your radiator; it also looks good. So good, in fact, that one leading MX5 enthusiast described it as: "The prettiest MX5 grille ever made". Fits all Mk2.5 MX5 models, 2000>2005. The mouth on an an MX-5 is the perfect trap for flying debris, so fitting one of these top quality black stainless steel hi-flow grilles is essential protection for your radiator. Mazda MX-5 Kühlergrill Grill mit Wabenmuster MX-5 NB 98-00 Frontgrill. Der hintere Grill in Edelstahl geflochten wird an dem Diffusor verschraubt. -Einbau von Tuning. MX-5 Antennenstab NB f. elektr. This is a genuine Zunsport kit so you are buying quality. Model Year Add to Favourites. Ease of Fit Product Code. 1994 to 1999 Product Code This is a genuine Zunsport kit so you are buying quality. 30 minutes Ease of Fit We also have products manufactured for ourselves and these are made to the highest standards. The Zunsport grille for the Mark 3 MX-5 has been carefully crafted to fit exactly over the existing plastic honeycombe grille. This is a genuine Zunsport kit so you are buying quality. The grille fits under the number plate plinth and through the plastic grille to achieve a safe and secure fixing. Mazda MX-5 Kühlergrill Grill mit Wabenmuster MX-5 NB 98-00 Frontgrill. Die Kühlergrills in Edelstahl geflochten geben dem MX-5 einen kleinen Touch von Nostalgie. Der Grill wird vor den original Grill montiert. The RX8 is an accomplished design but modest in appearance. This is a genuine Zunsport kit so you are buying quality. Model Year Add to Favourites. Ease of Fit Product Code. 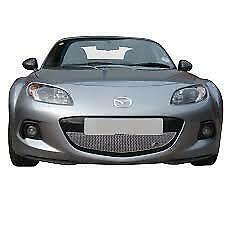 This MX5 Grille is for the Mk2 face-lift model (From 2001-2005). If you're looking for an MX5 grille that will not only protect your radiator but will also look good, then this is the MX5 Grille for you! Diffusoransatz inkl. Andernfalls wird die Beschwerde nicht berücksichtigt und keine Entschädigung anerkannt. CARBON-OPTIK Kühlergrill-Leiste. Es wird einfach mit 3M Klebeband aufgeklebt. - aus hochwertigem ABS Kunststoff. - hochwertig verarbeitet und 100% passgenau! Super Optik! Veredeln Sie JETZT! Ihr Fahrzeug schnell und günstig. Rennsport Honig-Waben Design. Dieses universal Wabengitter ist die optimale Abdeckung für ALLE Stoßstangen, Lufteinlässe, Seitenschweller, Diffusor, etc. Waben-Tiefe: 0,4 cm. Für Audi A4 B6/8E S4 RS4 Look Waben Sport Front Kühlergrill Grill 01-05. Honeycomb Depth: 0,4 cm. (e.g. bonnets, bumpers, side skirts, diffusors, air intakes, etc.). Solid ABS Plastic. BMW LCI Facelift 3 Series E90 E91 Touring Gloss Black Kidney Sport Grill M M3. Easy & Fast To Work With. 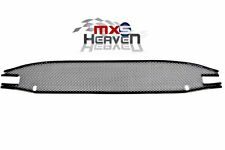 MAZDA 3 MK3 BM 2016 FRONT BUMPER GRILL GRILLE. (Bumpers, Spoilers, Splitters and etc.) ABS and Friberglass NOT painted and NOT ready for painting. Our team spent over 10 years to build our knowledge to highest lever. Zunsport grilles are easy to fit and once in place will blend with the original design precisely. Model Year 2002-2005. Ease of fit (out of 5) 2. Add to Favourites. MAZDA MX-5 NB Kühlergrill, Alu-. Das Teil ist nagelneu wird vor den original Lufteinlass (Frontschürzenmaul) eingeschraubt. Zunsport grilles are easy to fit and once in place will blend with the original design precisely. Model Year 2004-06. Ease of fit (out of 5) 2. Add to Favourites. We also have products manufactured for ourselves and these are made to the highest standards. PART NUMBER: MX52000A. Model = Mazda MX5 Mk2. Protect your radiator from rocks and debris in style with this black powdercoated grille. Requires removing tow hooks and easily installs under factory bolts. 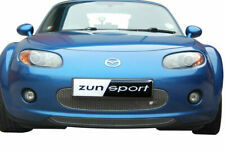 ZUNSPORT BLACK FRONT GRILLE for MAZDA MX5 2009- ZMA28009B (Models without a number plate). Model Year: 2009-. We also have products manufactured for ourselves and these are made to the highest standards. Mazda MX-5 Kühlergrill Grill mit Wabenmuster MX-5 NB 98-00 Frontgrill. Der aus Edelstahl polierte Grill verleiht dem MX-5 in Verbindung mit dem oberen Grill eine einzigartige Optik. Der Grill wird vor den originalen Grill montiert.